I’ve seen so many cute and clever ways of creating a pilgrim hat out of chocolate candies and decided to try my hand at making a little more elegant version of it. After playing around with a few techniques I settled on making a hollow chocolate pilgrim hat which I will fill with chocolate mousse. I created my hats by filling a small plastic cup with chocolate, then pouring out the excess to create a shell. When it was chilled and un-molded and set on a round of chocolate it made a perfectly shaped hat. Each hat is decorated with a band and buckle made of homemade white modeling chocolate. I used gold luster dust to make my buckles shimmer, but you can, if you prefer, just color some modeling chocolate yellow. I plan to fill my hats with chocolate mousse to serve for dessert, but they can be filled with anything you desire like marshmallow fluff, chocolate ganache, cheesecake filling, caramel, candies, or nuts. 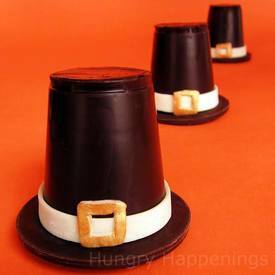 What would you like to find hiding inside your chocolate pilgrim hat this Thanksgiving?